"Casablanca" is larger than life, and it is a movie that I feel lives up to its own hype. I think it is indeed one of the very best movies of all time, and it is also an important building block which lead to what cinema is today. But I don't just love it for its importance to American cinema, I love it because I can also feel the need to re-watch it whenever. I think it is rich on that type of level, and it is something that is very special to me. Sitting in my dining room is possibly the slickest looking "Casablanca" poster, and I love how it really ties the room together. For Christmas, I got the movie along with "The African Queen," which I'll probably do next week. Re-watching the movie, I feel the power of cinema all over again. I know it has never felt like it on this blog before, but I am sucker for a good romance movie. Yes, I like "The Notebook," because it is a movie that does exactly what it sets out to do. There was no fooling on the marketing, "The Notebook" was clearly a straight-up romance movie. Not only that, but it is the most confident romance movie of the last twenty years, easy. I also feel the exact same thing about "Casablanca." It is not only a romance movie, but it is also a spy thriller. Being a fan of both the romance drama as well as the spy thriller, seeing how easily the two can be meshed together was a ton of fun. During the first ever Essentials review, I said everything was better with Bogart, that is Humphrey Bogart, my favorite actor. There was something very special about those old school movies back in the 1940's, and I think Humphrey Bogart was one of the all-time greats. It was pretty common during this time period that nearly every actor over-acted, and they had a tendency to overplay their roles. That wasn't necessarily bad because it was apart of the style. I never thought Humphrey Bogart did that, he always played his roles just right. It was also shocking just how witty and even funny he could be in a role. 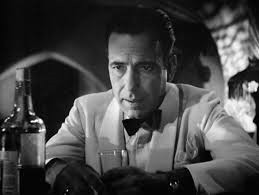 Rick Blaine is an incredibly iconic character, and part of the reason why the character appears on the AFI lists is due to the fact that Bogart played him well and brought him to life in a way no other actor could. Not to say that the rest of the cast isn't solid, because it is. Ingrid Bergman is outstanding in this, playing a sort of foil to Bogart's Blaine. This is a couple who fell drastically in love with each other, and were sadly pulled apart by some Nazi's and a wee bit of deception. Watching Bergman share screen time with Bogart is a treat and they do very good work together. Sydney Greenstreet is awesome, as is Paul Heinreid and Conrad Veidt. The music by Max Steiner is stupendous. There are very few musical scores from this era that could really draw me in. The music by Steiner is instantly iconic and it really sets up the movie the audience is about witness. This is an almost perfect example of how a song can set up a movie and its expertly handled. I also love the many quick shots of noir camera shots throughout the film and I love the use of darkness and light to set up tension in a scene. It is much more than style on display, it is art.